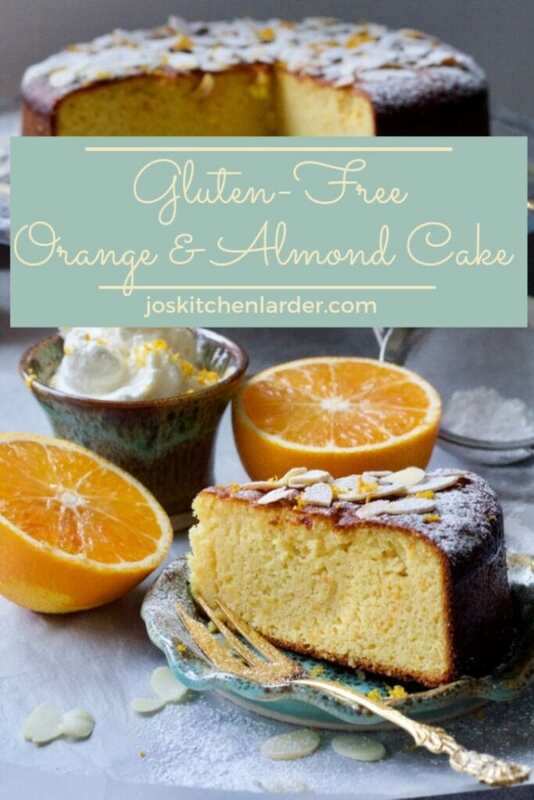 This Gluten-Free Orange and Almond Cake is simply sensational! Moist, nutty and with strong orange flavour this cake is also flourless, dairy and oil free. Serve simply with coffee or with Orange Whipped Cream as an indulgent dessert. With my favourite blood oranges currently in season I simply couldn’t help myself but to use them in baking yet again (you might remember my delicious Easy Blood Orange Drizzle Cake). Blood Oranges are in season from December through to March (some varieties even through to May). I must say I tend to add them to my weekly organic fruit/veg order religiously. I know what you are going to say, these oranges don’t look too “bloody”. Well, it all depends on the variety and you can get some that are almost crimson red or the ones that look like your standard oranges. Don’t worry though as it really is all about the flavour! You can of course use regular oranges here as well. I came across the recipe for this cake on numerous occasions and it appears it’s widely known throughout the interweb. Originally, this particular cake is known as Passover dessert but also in Moroccan and Spanish cuisines and generally across Mediterranean. 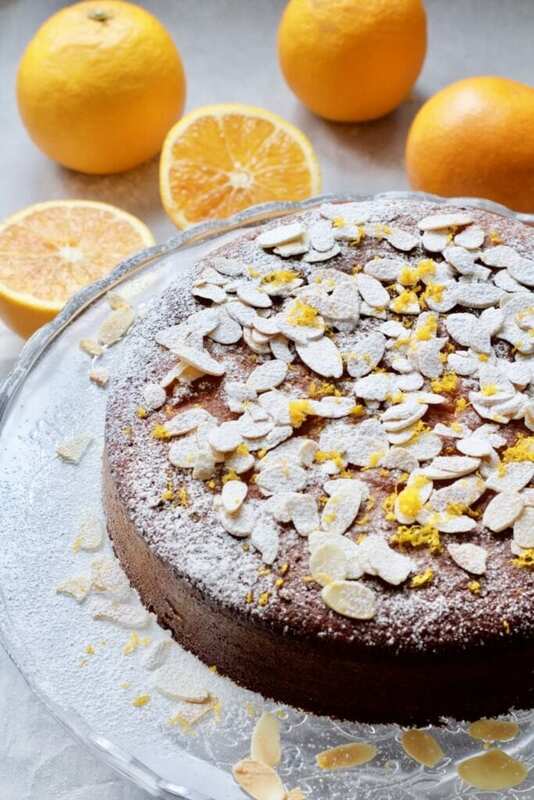 One very popular thing about this cake is the use of entire oranges (skin and all) which are boiled until soft and then pureed in their entirety. Majority of the recipes I’ve come across don’t use any regular flour or fat (oil, butter) at all which makes this lovely cake naturally gluten and dairy free and with no added fat. 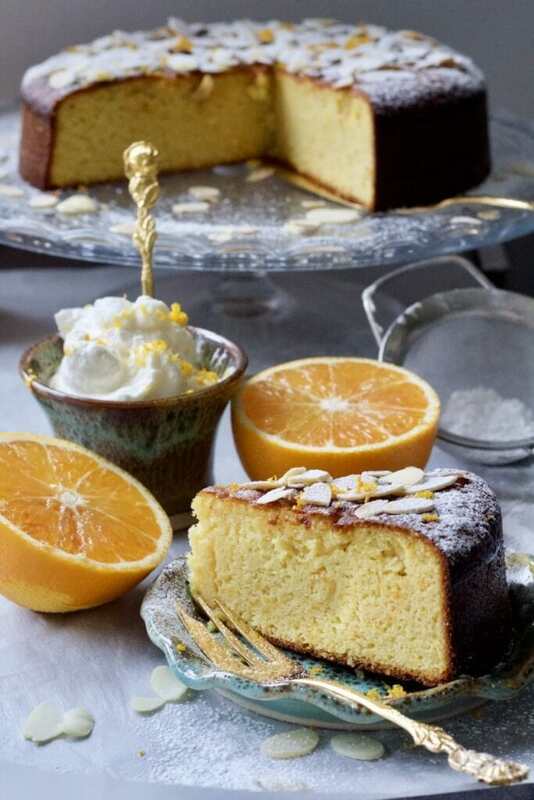 This cake (or take on it) has been very popular with a number of celebrity chefs including Nigella who’s recipe for Clementine Cake can be found in her book How to Eat*. I have, however, based my recipe on Claudia Roden’s A New Book of Middle Eastern Food: The Essential Guide to Middle Eastern Cooking* which is an incredible collection of simple, everyday recipes which (if you are a fan of Middle Eastern cooking) you will love. As already mentioned, the original recipe requires boiling whole oranges on the stove for a couple of hours until tender. I don’t know about you but as I’d rather get this done quicker then that I decided on using microwave instead. 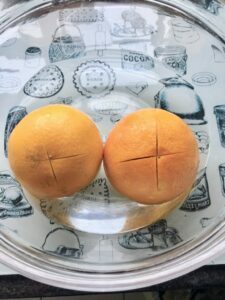 Simply pierce your oranges few time with a knife or fork or cut a little cross on top of each orange (to prevent them from bursting) and put them in a large microwavable bowl with a little bit of water. Microwave on high for approx 10 minutes et voila! 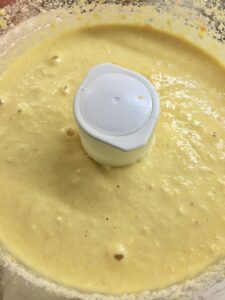 You could also use your Instant Pot*here if you prefer and get it done in 30 minutes using Manual setting. I would highly recommend using organic fruit here due to using skin as well and therefore consuming whatever there is on it. 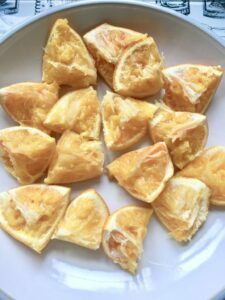 Once your oranges are cooked cut them into chunks and try and fish out any pips that might be lurking inside them as they might add slight bitterness to your cake. When baking, pay attention to your cake and cover it with some aluminium foil if it starts browning too much on top. I only line the bottom of the cake tin but if the one you are using is slightly unpredictable and might stick, then I would also line the sides. I baked cake plain and decorated it with lightly toasted almond flakes and icing sugar after. However, you could sprinkle some almond flakes on the top of the cake prior to baking, it will save you toasting your almond flakes later. This cake is perfect as is or sprinkled with toasted almond flakes and some icing sugar but if you would like to turn it into more elaborate and fancy dessert for a special occasion (think Valentine’s Day maybe?) you might want to serve it with this gorgeous Orange Whipped Cream the recipe for which I’ve included below. This whipped cream with a touch of orange liqueur compliments the cake beautifully! It can be also prepared in advance as it keeps really well when chilled in the fridge for up to 3 days. Can I freeze this cake? You absolutely can! Make sure your cake is completely cool first then take the piece you wish to freeze and wrap it tightly in a piece of clingfilm and then aluminium foil. Make sure to label it too if you don’t want to play “Freezer Roulette” later! Pop it in the freeze for up to 3 months. To defrost simply leave out on the kitchen counter and once defrosted decorated with almond flakes and icing sugar if you wish. Microwave your oranges on high for 10 minutes until soft. Cut cooked oranges into chunks and fish out any pips. 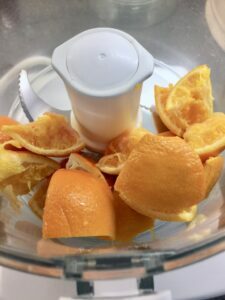 Pop cooked orange chunks into the food processor. Puree cooked oranges into a pulp. 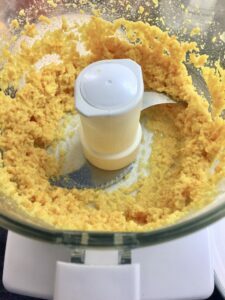 Put eggs and caster sugar in a food processor with orange puree and mix until you get pale yellow, slightly foamy mixture. Add ground almonds and baking powder and mix until just incorporated. You will get quite runny batter. Pour it into prepared baking tin and you are ready to bake. 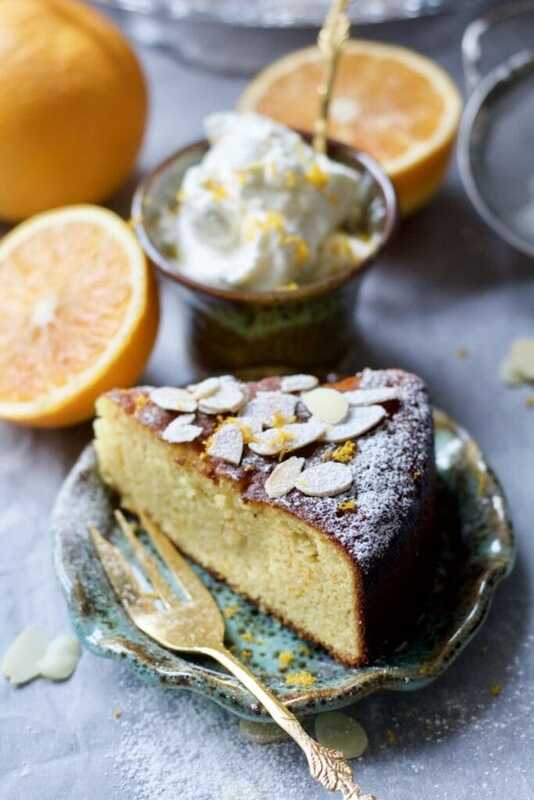 This Gluten-Free Orange and Almond Cake is simply sensational! Moist, nutty and with strong orange flavour this cake is also flourless and dairy & oil free. Serve simply with coffee or with Orange Whipped Cream as an indulgent dessert. Put oranges in a large microwavable bowl. Pierce them few times with the knife/fork or cut a small cross on the top of each orange. Pour in tap water half way up the oranges and microwave (covered) for 10 min on high until soft and knife goes in easily. Take cooked oranges out of the bowl with water and put them on a clean plate/chopping board to cool slightly. You can do this step ahead of time and simply keep cooked oranges in the fridge until you need them. Once cooled, cut the oranges into chunks (unpeeled) and remove any pips you can see. Put orange chunks in your food processor and blitz them until you get smooth orange puree. 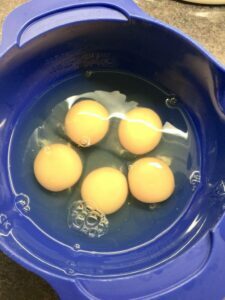 Add eggs and sugar and blitz some more until you get pale and foamy mixture. 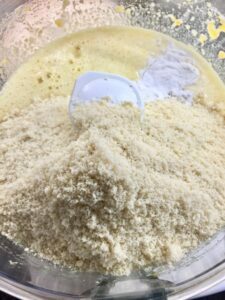 Finally, add ground almonds and baking powder and give it all last final blitz until all ingredients are mixed in and you've got a smooth and quite thick liquid batter. 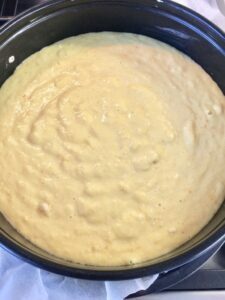 Pour the batter into prepared tin and bake for 40 minutes or until the skewer inserted in the centre of the cake comes out clean. Depending on the size of the cake tin you're using you might need to extend baking time. Feel free to cover the tin with some baking parchment or aluminium foil to prevent top browning too much. Once out of the oven, let the cake cool in the tin for a bit before taking it out onto the cooling rack to cool completely. Serve sprinkled with toasted almond flakes and dusting of icing sugar and accompanied by Orange Whipped Cream if you wish. If you have time, put the bowl you want to whip your cream in in the freezer for half an hour. This will make whipping the cream process a bit quicker. 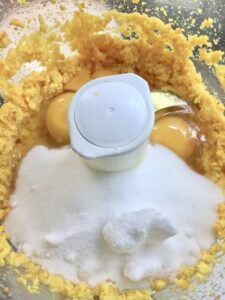 Pour whipping or double cream into your bowl and with an electric mixer or whipping attachment of your standing mixer beat the cream until it starts to form soft peaks. Sieve through icing sugar and pour in the liqueur you're using and continue beating until cream reaches desired consistency of stiff peaks. Take care not to overbeat as cream will turn into butter. 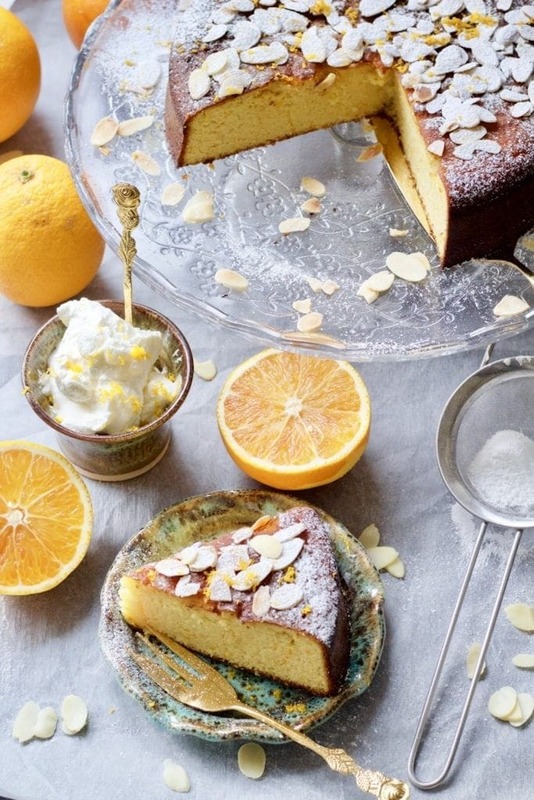 Serve immediately with your orange cake or store in the fridge until needed. Nutritional information is approximate and should be treated as a guideline only. It doesn't include Orange Whipped Cream which is optional and calorific but oh so worthy! Easy Blood Orange Upside-Down Cake – oh yes! Another blood orange cake! Pin Gluten-Free Orange and Almond Cake For Later! Thank you for another tasty addition for the gluten free world. And thank you for sharing it with Fiesta Friday. I just love blood oranges, don’t see them often enough! Thanks for sharing this recipe with Fiesta Friday! Citrus is the best thing about winters. This cake looks so pretty and love how it uses the whole oranges. A beautiful and delicious wintery cake. 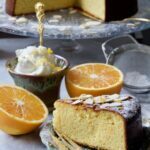 i’ve had a boiled orange cake a few times before – such an amazing flavour and I love the sound of your version with blood oranges! Thank you! 🙂 It is slightly strange sounding cake when you think about it (boiled orange cake lol) yet so simple and definitely delicious. Blood oranges are simply perfect for this cake. I love simple cakes like this that are perfect for the family or a small dinner party – or snacking!! The flavors are so perfect for this time of year! Thanks for sharing with us at Fiesta Friday! Hi Jo, This is such a wonderful recipe. Sharing. I love that this recipe uses the whole orange so there’s no waste. It is such a pretty looking cake! I could do with a slice right now! Thank you Cat! 🙂 You and me both lol! I love that this recipe uses the whole orange – I’ve never tried that before. Delicious looking cake! Thanks Mandy! It was a new thing for me too but it works so well. All the flavour and no waste! I loved reading about the history of this cake, and your gorgeous pictures—as always—make me want to lick my screen! You have such great tips here for making the cake that even though I’m not much of a baker, I’m making this over the weekend (I’ve been eyeing the blood oranges at my grocery!). Thank you so much Michelle! 🙂 This cake is so easy and pretty much makes itself so you don’t need to be a baker at all! 😉 Let me know if you make it! What an interesting cake I would love to try this it certainly looks amazing. Hi Jo. I make my own version of this cake and absolutely love it. I don’t make the orange whipped cream though – I think I’ll have to give it a go as I love alcohol spiked desserts! Oh my! that crumb! I’m drooling. I want to make it soon! I love anything with orange and almonds. Pinning! Thank you so much Lizet! 🙂 Oranges and almonds go so well together don’t they?